A wrestling team scores points via the results of individual wrestler’s matches. · 6 Pts. – Wrestler wins by pin or forfeit, injury default, disqualification of the opponent. · 4 Pts. – Wrestler wins by major decision (point spread of between 8 and 14 pts.). Teams can also be penalized team points for unsportsmanlike conduct and other violations of the individual wrestlers or the coaching staff. Near Fall (back points) = 2 Pts/3 Pts. Bottom wrestler has his back exposed to the mat on an angle of 45 degrees or less. · A count of at least 2 seconds, but less than 5 seconds, a 2 Pt. near fall is scored. · A count of 5 seconds or more a 3 Pt. near fall is scored. Penalty Points can be awarded to the opponent of the wrestler in violation of certain rules and conduct. One or both wrestlers not initiating action or one wrestler being totally defensive and backing away from opponent. Warning, followed by penalty of 1 Pt., with each additional incident incurring penalties of 1 Pt. – 2 Pts. – 2 Pts. – Disqualification. 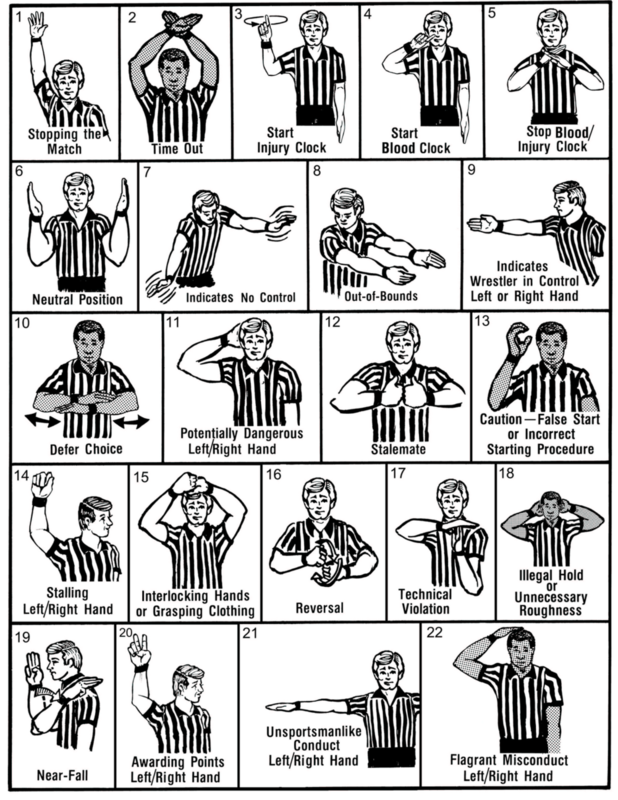 Starting before the whistle blows, top or bottom wrestler not aligned in the proper referee’s position. 2 warnings, followed by 1 Pt. penalties for each additional incident – No Disqualification. Immediate 1 Pt. penalty. Each additional incident is followed by incurring penalties of 1 Pt. – 2 Pts. – 2 Pts. – Disqualification. Full nelson, figure 4 the body, scissor the head, headlock without the opponent’s arm, etc. Grasping uniform/headgear, improper equipment (i.e. no headgear), fleeing the mat, unsportsmanlike conduct, unnecessary roughness Immediate 1 Pt. penalty. Each additional incident is followed by incurring penalties of 1 Pt. – 1 Pt. – 2 Pts. – Disqualification.